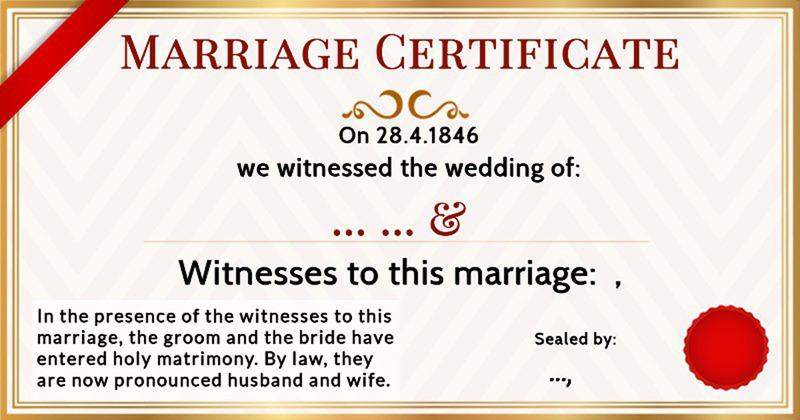 Is it possible, as the April 28, 1846 marriage certificate suggests, that “Twinklebear” Lesley Maclean and I were married on that day, a century and a half ago? Impossible to know for sure. However, there is one fact that Twinklebear and I are absolutely certain of, and it is that she and I have been husband and wife in past lifetimes. That makes our solemn oaths applicable and appropriate, for our situation. What is our “situation?” That’s simple, yet hard to explain to everyone else. Simply stated…. We are reincarnated lovers and spouses. I’ll give you all a moment, to digest that. Okay, a moment is over. Ha! This is actually something that Twinklebear and I both knew since the very beginning—the beginning being late 2015, when we “found” each other again, in this lifetime. Unlike a Hollywood movie though, where the reincarnated heroine and hero miraculously and instantaneously remember the details of their past married lives—Twinklebear’s and my recollection was more amorphous. For us, it was slowly sensing this deep and long history, obscured by the march of time, and turnover of lives. Hey man, being born into new lives as different people, would confuse you, too! Hastings, England, where Twinklebear is from, has a section of the town that is named “Old Town.” Old town is simply the section of Hastings, that has existed the longest. Old Town is the oldest part of Hastings. Likewise with Twinklebear and me, there is the New Us consisting of the people we are now, in this lifetime—and the “Old Us,” which were the people we were when we were a married couple, in past lives. We both sense this history, and know our long history, as devoted Twin Flame Soulmates, and husband and wife. Many would question why we are so devoted to each other–as on the surface—we “just met” two years ago. The reason is, we didn’t just meet. The truth is, we found each other again, after many years and perhaps centuries–apart. This is why I will always love, cherish, and if necessary—rescue and protect my “Twinklebear” Lesley Maclean, as I have in past lives—and as I will in all future lives. Oh my sookybear, such a lovely sentiment, and wonderful article. We are always twin flame , soulmates, always and forever! You are my world. I love you, now and always.. thank you , for writing this great piece. Now ” put the rubbish out! ” Ha! 121212 ” kidding! ” Eternally yours.